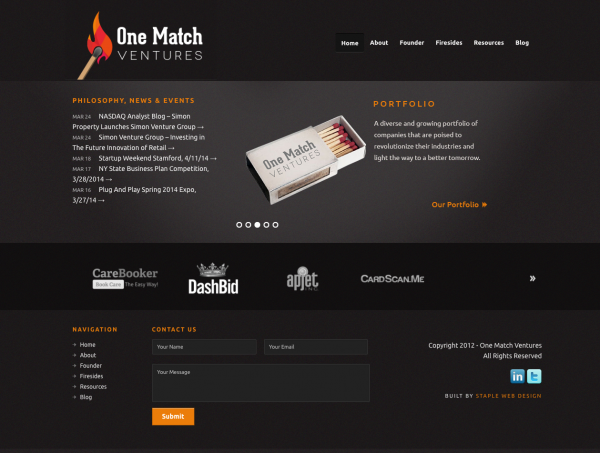 One Match Ventures is a seed fund company that focuses on investing in talented entrepreneurs and ideas. They contacted me to design and build a website for the business. Building a website that was simple, responsive, and easy to find information for both entrepreneurs and investors was a priority. Building on a darker color palette with splashes of bold reds and oranges helps to unite the design and the brand behind One Match. You did such great work on the site, and put in the time needed to make the website great, not just good enough! We both love it! !